So far, my most favorite discovery since cutting all ties to Carrefour has been biocoop which is literally five minutes away from my home, which makes me feel like the figurative village idiot. I can't believe I have lived in this neighborhood for over a year and never set foot in this wonderland of organic and fairly traded food stuffs and other products. 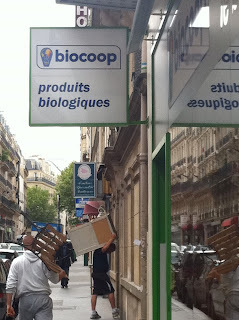 Biocoop seems to have a wider selection than its chain store competitor, Naturalia, and carries many of the same products- often sold at a lower price. A (totally random) sampling of a few products sold at both locations showed that while some prices were essentially identical (Simpsons Organic Pasta: 2,10€ at both, Lima Blue Tortilla chips 2,21€ at Naturalia and 2,20€ at biocoop) there were some significant price discrepencies on certain products (Danival Organic Tomato Sauce with Tofu: 2,90€ at Naturalia and 2,79€ at biocoop). Biocoop also offers an extensive selection of bulk dry goods- so instead of paying upwards of 4€ on granola at Naturalia, you can choose your amount and take home enough for a few organic yogurt (of which there is quite a selection at the coop) pilafs for around one euro. which is much more priced than at Naturalia. You can pick and choose microbrews that hover around 1,80€ a bottle- just be sure not to pick up a non-alcoholic brew by mistake, they are deceptively mixed in with the adult beverages. 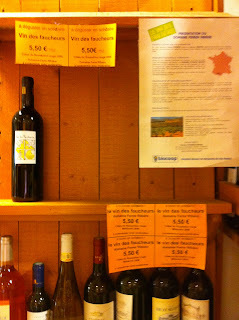 Our personal favorite is the "Vin des Faucheurs" which is sold for 5,50€ a bottle. This absolutely delightful red is sold to support the faucheurs- activists that cut scythe genitically modified crops (OGM in French)- with the proceeds going to paying these scofflaw farmers fines and legal fees. The bottle explains that, "No insurance can cover the environmental and public health risks linked to OGMs, simply because these risks are incalcuable and irresversible". It is a pleasure to support the civil disobedience of those engaged in the fight against food facism- and the wine is really, really good! My first visit to biocoop was memorable, I was like a kid in a candy shop and completely mesmerized by my surroundings. As I approached the check-out line I overheard a man, most likely the owner, passionately describing his negotiations with a farmer in Brittany- surely the next member of the coop family- and I hoped to see more radis noir and other products from the fertile Northern territory to be on the shelves soon. I was then checked out with a smile by what I assume to be the other owner of the coop. I then ran home with my goodies and have been enjoying the spoils ever since!